How do I Install Usage Meter on my Windows PC? 1) Click the download button below. The browser may prompt you to save or to open the file. If this happens, select the "Save" option then click "OK."
2) Double-click the file. Windows launches the HughesNet Usage Meter Setup Wizard. 3) Click "Next" and then click "Finish" to finish the installation. 4) The Usage Meter icon will appear in your system tray. 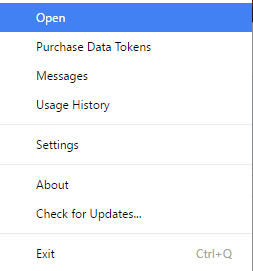 In order to see the icon, you may need to expand the system tray by clicking its up arrow. 5) Right-click the Usage Meter icon to launch the meter's context menu.